Courtesy of René De Bondt, Belgium. 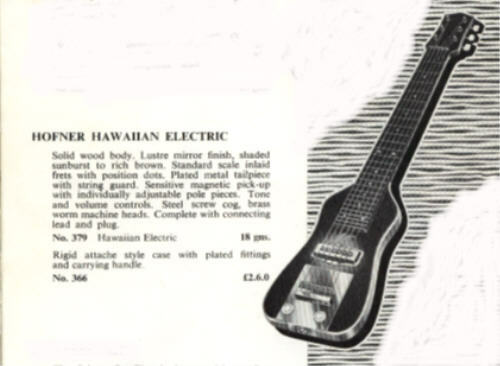 By the 1950's however, Selmer were offering two Hawaiian guitars without amplifiers, these being called the Proelectric and Portalectric models. The body of the Portalectric actually formed the lower part of the guitars case. All one had to do was take off the lid and start playing! The 110 Model with a waisted body and conventional sunburst finish. The electrics fitted were very simple with no built-in Volume and Tone controls. The fingerboard had 20 frets. The 111 Model, which was very similar to the Type 110, but with built-in Volume and Tone controls. Until around 1955, this guitar had a 20-fret fingerboard, but this was then changed to a 25-fret board. The 115 Model with a "contemporary-style" trapezoidal shaped body finished in pearloid material, and with 25 frets. The 116 Model, the same as the 115, but with 8 strings. The 117 Model, A double-neck version of the 115. The 118 Model, A double-neck version of the 116. By 1955, the 110, 116,117, & 118 Models had disappeared, leaving the 111 and 115 Models to have a very long production run, by Hofner standards! These two models remained in the price lists until finally being removed in 1992. Changes were made during the course of time, but these really amounted to little more than changes to pickup types, in line with Hofner's general pickup development. 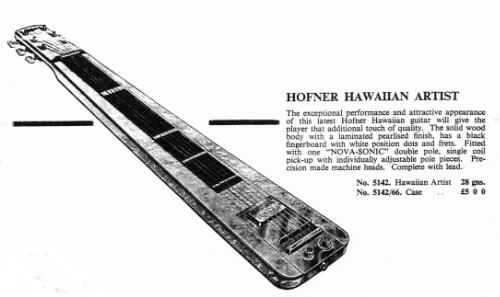 The Hofner 111 Model, but called by Selmer the "Hawaiian Electric" model, appeared around about 1955/56 in the UK Selmer catalogue for the first time, although the Selmer Company were already offering two other non-Hofner lap steel models labeled as the Selmer "Novelectric" and "Proelectric" at that time. As can be seen from the above picture, the Hofner Hawaiian (Model 111) was finished in brown sunburst and was fitted (initially) with a single Fuma pickup. The two Selmer labeled lap steels in the 1958 catalogue were each fitted with a "Selmer 6-in-1 pickup unit, Patent No 2660/45". Although Hofner did make guitars such as the Triumph, Astra, and Diplomat models in the late 1960's for sale under the Selmer label, my guess is that this was not the case with the Novelectric and Proelectric, as they also would have been fitted with Fuma pickups. In any case, the Proelectric is such a similar instrument to the Hofner Hawaiian model, and it would have been illogical for Hofner to have made both guitars. The 115 Model pictured above finally made it into the UK Selmer catalogue by 1963 - called the Hofner "Hawaiian Artist" by Selmer. It was initially fitted with the same Fuma "Star" pickup as the Model 111, but this was changed to a standard Hofner Type 510 unit by late 1963. This guitar was more expensive than the Model 111, (Selmer's "Hawaiian Standard"). The price for a Standard in 1963/64 was 21gns, whereas 28gns was charged for the Artist. A change from the Fuma pickup to the Type 510 on the Hawaiian Standard seems to have occurred at the same time as the Novolectric and Proelectric were dropped by Selmer. As stated above, manufacture of the Standard/Model 111 and Artist/Model 115 seems to have continued at least until 1991/92, although the supply of these instruments to Selmer would have dried up, together with the rest of the Hofner models, in the early 1970's. The Hofner Hawaiians were still there in the Selmer 1972 catalogue, but perhaps that was old stock in the UK being sold off. Hofner changed from bound to non-bound body top-edges for the Model 111 frequently. Perhaps different luthiers employed on making the laptops at different times had different ideas? Who knows? During some periods, the pickups were mounted on a large base plate also accommodating the bridge and rotary controls; at other times, the pickups were mounted independently of the plate. Changes were also made made to the two models was to up-rate the pickups. broadly in line with the rest of the Hofner range. 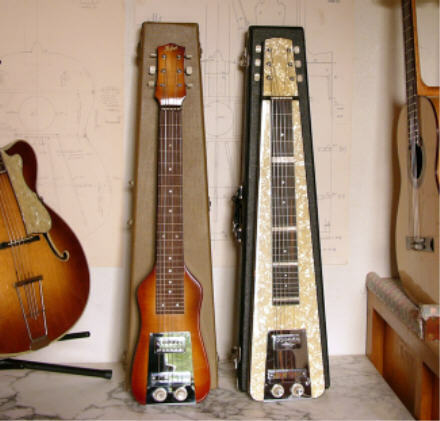 Hence, examples of both guitars can be found with the "Super" and Twin Exposed Pole versions of the Type 511, as well as the Type 510, Type 513, and the early Fuma units previously mentioned. During the 1980's, supplies of these "old" style pickups had dried up, and so Hofner appear to have re-designed the tailpiece/bridge/pickup plate on the Hawaiian guitars in order to accommodate a single coil pickup (probably made by Schaller), together with the jack output socket set into the top face of the guitar instead of the tail side as previously. c1968 HOFNER HAWAIIAN GUITAR - MODEL 111 fitted with Type 510 "Diamond Logo" Pickup. 1980's HOFNER HAWAIIAN STANDARD - MODEL 111 fitted with single coil pickup and revised bridge/tail plate.